It’s hard to live in Vienna and not know about the tremendous cultural resource that is the Wolf Trap Foundation for the Performing Arts, nestled near the Dulles Road toward Tysons. I first went to Wolf Trap as a graduate school summer intern in DC, and my roommates invited me to sit on the lawn for Shawn Colvin. It was a muggy Washington summer night, but the wine was flowing and the music was blaring. There’s nothing like a summer evening at Wolf Trap. Fast-forward 11 years: I don’t go out in the evenings most nights because the Bug is sleeping. So I decided to check out Wolf Trap during the day. While there wasn’t any wine (he he), there was the fabulous Children’s Theatre-in-the-Woods (CTW). 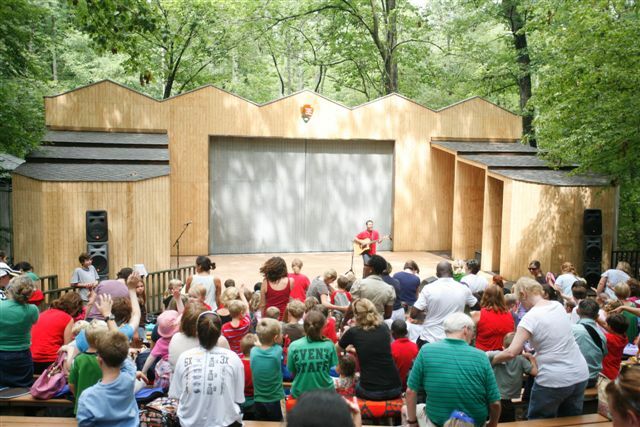 A summertime tradition for generations, CTW is an outdoor theater offering a place for families and groups of children to enjoy a rich variety of music, dance, storytelling, puppetry and theater. It is a professional performance, yet accessible for younger audiences. Here’s what you get for $8 a person: two different 45-minute performances and additional activities offered five days a week (Tuesday through Saturday). The first show is at 10:00am. After that show, you can stick around for a hands-on workshop with the performers of the show you just watched! Or, you can stay for the second show that starts at 11:00am and after that, participate in the U.S. Park Service’s Junior Ranger program, where a Ranger leads a guided nature tour – remember that Wolf Trap is a national park for the performing arts. I went with Ladybug and a fellow mom friend and her daughter to the performance of City Dance and Music with Milkshake. There is no doubt these are professional, top-rate performances. It was a delightful set of performances. However, my experience was one of those instances where I realized that Bug was still too young to benefit from the opportunity. The floor was dirt, and she loves picking up dirt so it was soon all over her. She couldn’t sit still – and quietly – for more than 10 minutes (which is actually a long time for her), so I spent most of the time walking her around and then carrying her out periodically when she got too rowdy. The bathroom was a far walk back toward the car, so I was changing a poopy diaper on the bench nearby. All in all, I ended up feeling defeated and like I didn’t enjoy the experience. Sometimes I’m so eager to expose her to the good stuff that I don’t realize until it’s too late that it’s not age appropriate for her. I think CTW is wonderful, and I can’t wait to take Bug back when she is preschool-aged and can sit and appreciate it all. It will be amazing. Behind the Curtain event. Explore opera hands-on and from every angle on August 9. Baby Artsplay. For parents, educators and caregivers of infants and toddlers, this program supports the intellectual, language/ emergent literacy, social, emotional and physical development of children three to 36 months of age. Artsplay. For ages three to six years. Djembe Drumming and Drama. For kids in Kindergarten through second grade, where they create a musical tale through drama, movement and song with Wolf Trap Teaching Artist Kofi Dennis (I went to a community drumming event in the winter led by Kofi, and it was super cool). Great post! I tried to fnd out more info about Baby Artsplay on the Wolftrap website, but I just saw a description of it with no schedule attached. Do you think it’s a fall program only? If you hear of a class coming up soon, let me know! I don’t believe it’s a Fall only program. I think registration opens up pretty soon for the fall, though.